Introducing the newest student apartments on the hill in Boulder, the Plaza on Broadway Apartments. These spectacular new luxury student apartments in Boulder are perfectly located directly across from the University of Colorado offering CU students the newest in off campus housing rentals. Plaza on Broadway Apartments offers trendy floor plans designed with luxury student living in mind. The units include two, three, and mainly four-bedroom formats. 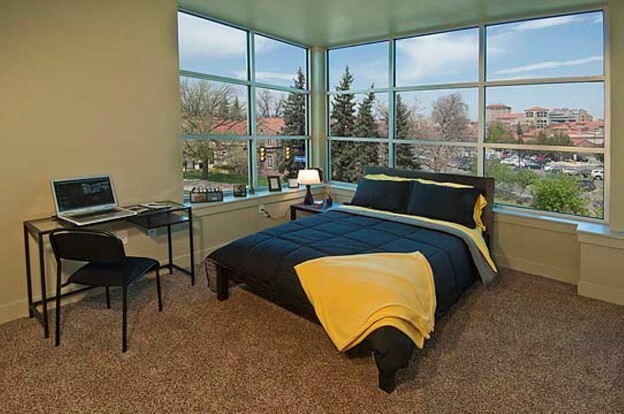 With two buildings to choose from, you are sure to find the unit that is perfect for you! Plaza on Broadway Apartments offers two buildings with unique location attributes. The North Building fronts Broadway and is directly across from the CU campus, while the South Building backs up to Aurora Avenue and provides mountain views. Each building has an inner courtyard, and a paseo walkway lies between the two buildings – allowing residents to truly be a part of the Plaza community experience while enjoying the Boulder outdoors. At Plaza on Broadway Apartments, student renters are provided with a very simple leasing program – each resident is accountable for their own lease. This eliminates the need for you and your roommates to designate a single signer to assume leasing responsibility for the entire group. Should one of your roommates decide to leave Plaza prior to the fulfillment of their lease, they alone would be liable for any penalties. This entry was posted in Boulder and tagged Apartments on the Hill, Boulder Off Campus Housing, boulder student rentals, Student Apartments Boulder, Student Rentals on the Hill on May 22, 2013 by John Iannone.